This pure .999 pure ½ ounce silver coloured coin is limited to 8,000 sets only. 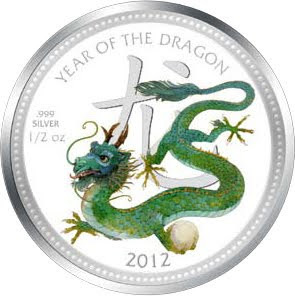 The coin depicts a colour printed Traditional Chinese Dragon holding a Dragon Pearl. The image is backed by an engraved Chinese symbol for "Dragon". The obverse of the coin features the Raphael Maklouf effigy of Her Majesty Queen Elizabeth II, sovereign of the Commonwealth and Niue Islands, along with the year of issue (2012) and the denomination of $2. Each set is presented in a unique gift packaging featuring a replica of a dragons egg.